Precision Metal Cutting - Metal Band Sawing Service | DIX Metals, Inc.
Dix Metals offers several methods of precision sawing, each intended for specific types of materials and configurations. 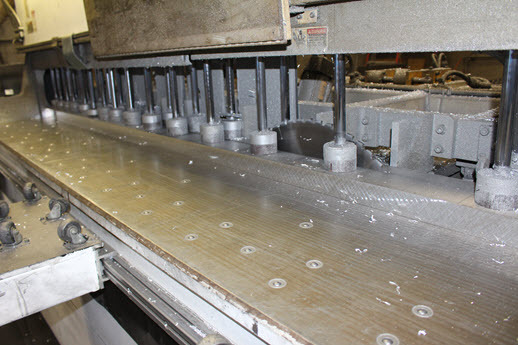 Our capabilities encompass precision sawing of aluminum plate up to 12” thick to cut-off services of aluminum extrusions, bar, and round stock up to 16” in diameter. Dix Metals provides metal cutting services to a wide range of industries. requiring the highest quality machine-ready blanks. While we offer metal cutting services primarily for aluminum plate and bar, Dix Metals can process nonstandard materials, including plastics, thermoplastics, stone, marble, granite and composites. Dix metals operates 6 plate saws on multiple shifts and includes automatic cut-off saws, horizontal band saws and vertical band saws. Material capacity of 12" x 144" x 144"
Dix Metals also operates a state-of-the-art waterjet cutting, featuring two waterjet systems: Flow Corporation’s newest 60,000 PSI technology on a dual head system and a Dynamic head waterjet with Active Tolerance Control. Our waterjet equipment provides an outstanding alternative to other cutting means such as laser, flame or plasma cutting. Additionally, waterjet cutting offers lower overall costs because of faster production rates and optimal part positioning, which substantially reduces material waste. This form of cutting is indeed incredibly precise, providing machine-ready blanks with optimal quality and minimal burr. There is also no stress or distortion placed on the material during production.